I am from Orange County, California (USA). A creative developer who can code, draw, and design. However, I am not pixel perfect. I see through many perspective and use that to improve the experience of a website. I am more of a painter than a designer. If you have trouble communicating, I can also communicate visually. Allow me to talk to you in pictures. Henry was a professional. When other developers were basically telling me they understand what I mean, hire me, Henry was honest and told me exactly what he would do prior to getting the job. Henry was very open and advised me on the best solution. His honesty and professionalism is why I picked him. He is a developer you can trust and I will definitely be working again with Henry soon. Henry has been extremely patient throughout the entire process with making things pixel perfect. I highly recommend him for other designers that are looking to get things done in the most visually beautiful way possible. Top Class web developer.. Went above and beyond to help me with my task. And completed the task way before the deadline.I asked him to customize a theme. Did it exactly how I wanted it to be done.If I can give him 10 stars I would.Thanks Henry for a Job well done. Great communicator, knowledgeable, reliable & professional! Henry did a great job. Fast, excellent communication! Henry is very thorough and his communication is top-notch! I highly recommend hiring Henry. Henry is skilled, reliable and an outstanding communicator. Great work! Henry communicated clearly, asked excellent questions, is a consummate professional from top to bottom. 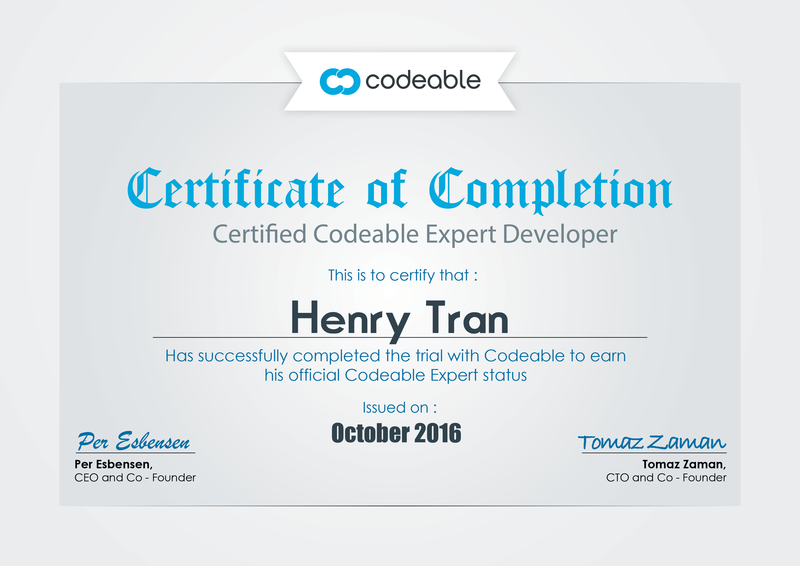 Henry gives Codeable a good name and I ill definitely use this service again. I've worked with Henry on numerous projects and continue to be impressed with his services. He has excellent technical expertise and communication is consistently excellent.